Insects appear suddenly in the fossil record, fully formed and without ancestors. So, how have evolutionists tried to solve this hexapod gap conundrum? One popular hypothesis proposes that insect abundance and size were constrained by low oxygen levels in Earth’s atmosphere during the late Devonian geological period. The overall idea seemed to have some support based on a model of atmospheric oxygen over the past 570 million years developed by Yale geochemist Robert Berner in which he compared ratios of carbon and oxygen in ancient rocks and fossils.6 Based on this model, atmospheric oxygen that coincided with the start of the hexapod gap was lower than 15%. Modern atmospheric oxygen is about 21%. The low oxygen levels were thought to have somehow suppressed evolution of the hapless insects. In a study published earlier this year, researchers updated the decade-old oxygen level model using more extensive carbon records.3 The new data showed that the dip in atmospheric oxygen during the late Devonian did not exist. 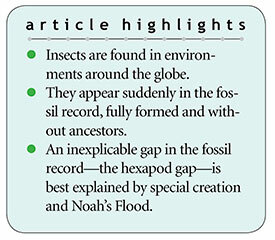 One of the study’s coauthors, Stanford paleontologist Jonathan Payne, stated, “What this study shows is that environmental inhibition by low oxygen can be ruled out because it is not compatible with the most current data.”5 Evolutionary researchers are now back to square one in explaining the pestering hexapod gap and why insects show up suddenly in the fossil record fully diverse in all their various kinds with no evidence of evolution. Insects were created by God according to their kind, fitting perfectly with the facts of science. 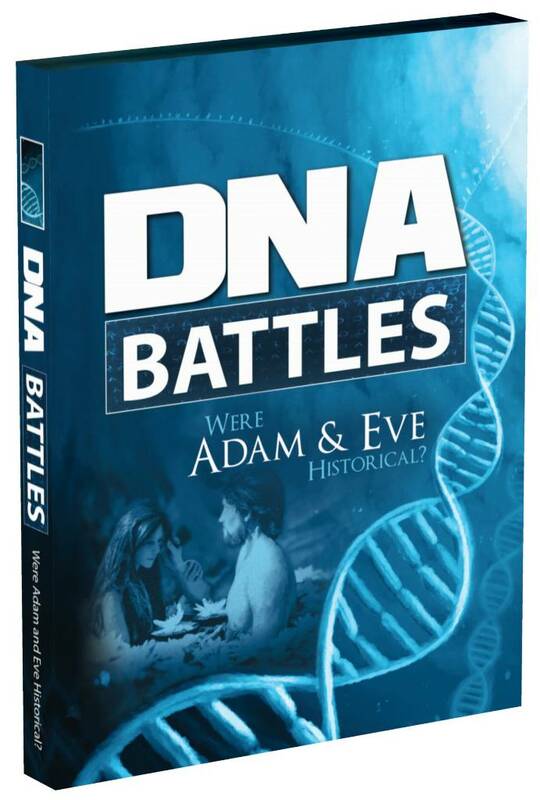 So, how do creationists make sense of these data if evolutionists can’t? As indicated in the Bible, about 4,500 years ago a global catastrophic flood rapidly buried billions of plants and animals now found worldwide as fossils in sedimentary rocks. The gap is readily explained by ground-dwelling, wingless insects inhabiting lower-altitude ecological zones being buried earlier in the Flood, while the winged insects and those inhabiting higher altitudes were buried later. The reason insect fossils appear suddenly and show no sign of having evolved is because they were created by God according to their kind, fitting perfectly with the facts of science. Clapham, M. E. et al. 2016. Ancient origin of high taxonomic richness among insects. Proceedings of the Royal Society B. 283 (1824): 20152476. Engel, M. S. 2015. Insect evolution. Current Biology. 25 (19): R868–R872. Schachat, S. R. et al. 2018. Phanerozoic pO2 and the early evolution of terrestrial animals. Proceedings of the Royal Society B. 285 (1871): 20172631. The subphylum Hexapoda, Greek for “six feet,” encompasses a majority of arthropod species, including insects. Than, K. Insects took off when they evolved wings, Stanford researchers find. Stanford University news release. Posted on news.stanford.edu January 23, 2018, accessed May 10, 2018. Berner, R. A. 2009. Phanerozoic atmospheric oxygen: New results using the GEOCARBSULF model. American Journal of Science. 309 (7): 603-606. 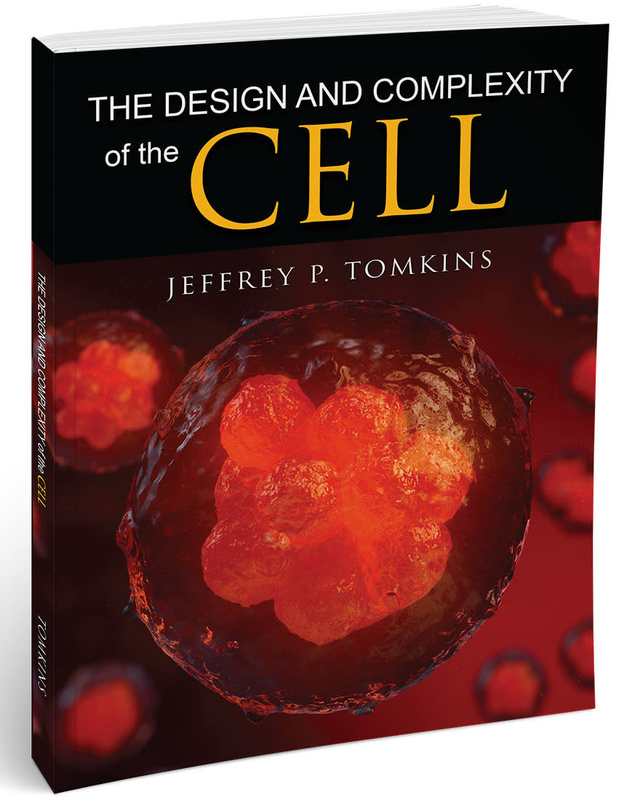 Cite this article: Jeffrey P. Tomkins, Ph.D. 2018. Evolutionists Can't Fill the Hexapod Gap. Acts & Facts. 47 (8).